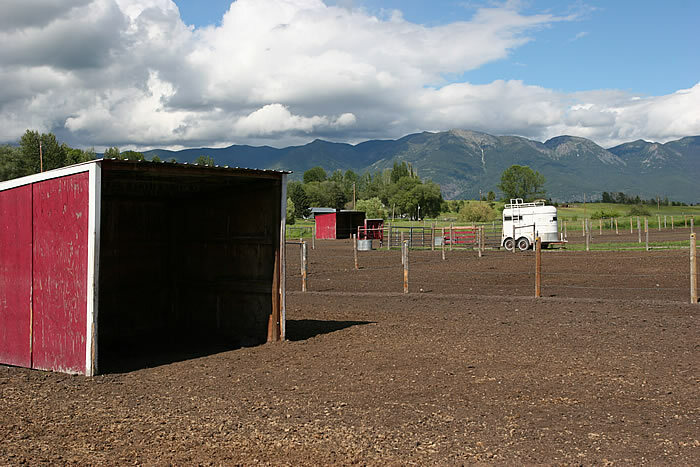 In 1995, my husband and I started building a facility for boarding horses on our 10 acres of land, located just outside of Kalispell, Montana. Horses are part of my heaven on earth. Even though my husband and I both work full time jobs, I could never afford more than a couple of horses of my own. By starting this business, not only can I help others enjoy these wonderful animals, but I can also surround myself with an average of 35 horses each year. Each horse has its own unique personality, very much like our own, and it's a great feeling to wake up each morning to hear and see them beginning their own day, and watching their personalities mesh. Over the years, our business has grown, requiring my husband to build many barns, tack lockers and stalls. He also added a round pen, an outdoor riding arena and arranged numerous grazing fields in different sizes. For our boarders and our own convenience, he put in water and electric from one end of the property to the other, allowing each field to have heated water tanks and frost-free hydrants. Both come in very helpful with Montana weather. We also constructed gravel lanes to each field. Our fencing is constructed from wooden posts with smooth wire and electrical lines. All of our fields have metal gates with safe chain clasps. We created our fields so that every field opens into a lane that is also fenced. This way, if your horse happens to get away from its field, or unties from one of the many crosstie areas, it will once again be in a fenced area. This is perfect for those rebellious personalities. If your horse decides to sprint off in the wrong direction, no one will have to chase him.